This beautiful, exclusive home and its stunning gardens are now available for hire as a wedding venue for Civil Marriages, Ceremonies and Wedding Receptions, one of the most romantic locations set in the heart of the Northamptonshire countryside, Deene Park has been famously photographed for Tatler and Country Living magazines. The Regency Ceremony Room is an impressive yet romantic room decorated in a style typical of its period with views across the parterre garden to the rolling parkland beyond. The room is available to hire for a Ceremony only or as part of our Ceremony Package, which includes the Tudor Great Hall, Inner Courtyard for your post-Ceremony drinks reception and a beautifully appointed private room with en suite shower room for the bride to prepare for her special day. Bookings are now being taken for the 2018, 2019 and 2020 seasons, viewing is by appointment only; for further details and to discuss plans for your special day please contact Tina Jeffery at tina.jeffery@deenepark.com or on 07561 820828. To download our digital Wedding Brochure click here. The Great Hall, built in 1572 with its impressive stained glass windows and hammer beam roof is the perfect place to enjoy drinks, canapés and to toast the bride and groom before departing for the gardens and the all-important photos. The Tudor Great Hall is accessed via the Inner Courtyard and weather permitting your guests can also enjoy the ambience of this historic location while sipping their Pimms or pink Champagne. 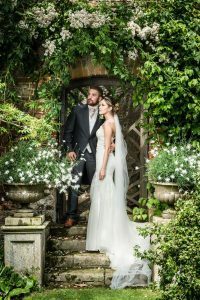 Following the drinks reception we leave the historic rooms of the house and move into the formal splendour of the enchanting south-facing gardens, famously photographed over the years for Tatler and Country Life magazines these romantic gardens are the ideal setting for photographs. Making your way west through the gardens will lead you to the Walled Garden, the venue for your marquee and wedding reception. The extensive parkland with its views of the house and lakes is suitable for the hosting of Asian Weddings and other large celebrations and events. We have a full list of reputable suppliers covering a range of products and services.